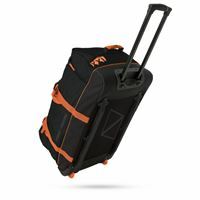 Wheeled gear bag with large center compartment including a separate section for wet kit that uses an easy Velcro opening. End pocket at top for easy to reach items, that can be accessed when bag is stood up or lying down. The bag features a hidden pocket at the front to put additional items in and size of the bag can be adjusted through 2 integrated straps with buckles, leaving a neat finish. 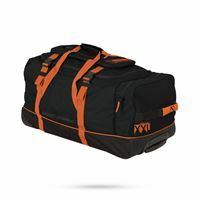 Perfect bag for all your kit at events and travelling!